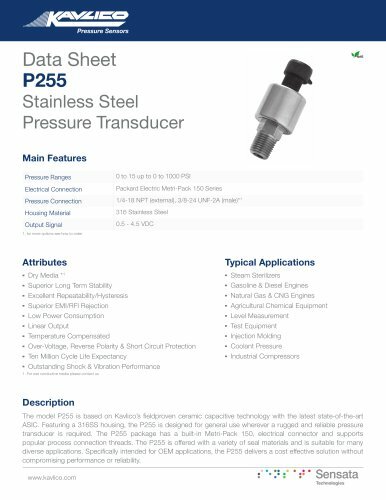 Data Sheet P255 Stainless Steel Pressure Transducer Main Features Pressure Ranges Electrical Connection Pressure Connection Housing Material Output Signal 1. for more options see how to order 0 to 15 up to 0 to 1000 PSI Packard Electric Metri-Pack 150 Series 1/4-18 NPT (external), 3/8-24 UNF-2A (male)11 316 Stainless Steel 0.5 - 4.5 VDC Typical Applications ■ Steam Sterilizers ■ Gasoline & Diesel Engines ■ Natural Gas & CNG Engines ■ Agricultural Chemical Equipment ■ Level Measurement ■ Test Equipment ■ Injection Molding ■ Coolant Pressure ■ Industrial Compressors Attributes ■ Dry Media 11 ■ Superior Long Term Stability ■ Excellent Repeatability/Hysteresis ■ Superior EMI/RFI Rejection ■ Low Power Consumption ■ Linear Output ■ Temperature Compensated ■ Over-Voltage, Reverse Polarity & Short Circuit Protection ■ Ten Million Cycle Life Expectancy ■ Outstanding Shock & Vibration Performance 1. For wet conductive media please contact us Description The model P255 is based on Kavlico’s fieldproven ceramic capacitive technology with the latest state-of-the-art ASIC. Featuring a 316SS housing, the P255 is designed for general use wherever a rugged and reliable pressure transducer is required. The P255 package has a built-in Metri-Pack 150, electrical connector and supports popular process connection threads. The P255 is offered with a variety of seal materials and is suitable for many diverse applications. Specifically intended for OEM applications, the P255 delivers a cost effective solution without compromising performance or reliability.